When you start dating someone the furthest thing from your mind is their financial habits. In fact, for some, it may not even be a conversation that’s breached until you’ve tied the knot. People often find out too late about their partner’s financial woes. Unfortunately, marriage takes more than just love to make it work and things like finances can sometimes make or break a relationship. Like all other aspects of life, finances are usually something you share in a marriage. It’s something that rests upon both of your shoulders. 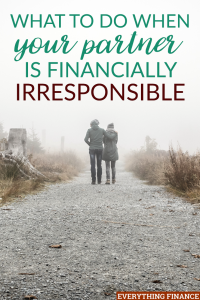 So, what are you to do if you find that your spouse is financially irresponsible? Here are six steps to take if your partner has a lack of financial goals, a tendency to overspend, or is seriously in debt. The first step you should take in this situation is to evaluate the problem. Assess the issues your partner is dealing with. What is their primary struggle financially? Are they prone to overspend constantly, seriously in debt, or do they merely lack financial goals or any kind? Or is it a combination of a few of these? Moreover, do some critical thinking to see if you can figure out the root of the problem. Maybe your partner’s tendency to be financially irresponsible comes from the fact that no one ever taught them how to handle money well. But, maybe they have a more serious problem that their financial woes stem from. Whatever the reason, assessing the situation beforehand can help you better understand your partner and where to go from here. Communicating with your spouse or significant other is always a good idea. Try to approach the conversation without pointing fingers. Let them know that you need to reevaluate spending habits or discuss your budget, so you can start a conversation without them getting instantly defensive. Discuss your concerns with your partner, while also getting the point across that they can’t keep handling finances this way. This is also a good time to try and understand where they’re coming from and why they might have a problem. Try to be empathetic rather than scolding. Being open and honest can be the key to getting to the root of an issue. In some cases, if your partner has already done damage, you may need to take steps to repair your finances. Sit down together to come up with a plan, so your spouse is not only participating equally, but so that they can see firsthand how they might have to alter their financial habits. Work to create a plan that sets you and your partner up to save, budget, chip away at any debt, and set up long-term financial goals. Trying to break a habit of any kind is bound to take time, which is why it may be wise for you to take over any bill paying while your partner tries to work through their financially irresponsible habits. By doing so, you’ll always make sure the bills get paid so that you don’t get behind. That being said, however, try to keep your partner in the loop as to when bills get paid and what they need to pay, if you each pay an amount. It’s still important to work as a team, but until your partner becomes more responsible with their finances, it’s imperative that the more responsible party take over for a little while. There are moments when you may not be able to handle things on your own, whether that’s with your finances in general or with your spouse’s habits. Depending upon your situation, you may need to enlist the help of a professional. If your finances have spiraled out of control, a financial counselor can help you take the right steps to get back on the correct path. Moreover, having the voice of a third party can help prevent your partner from feeling ganged up on or singled-out. If your partner’s habits are a part of a much larger problem, now might be the time to enlist the help of a professional counselor. Again, someone for them to talk to that can help them deal with any underlying issues; things they might not be as willing to talk to you about for fear of feeling judged. Unfortunately, you can take all of these steps and still not make any progress. For some, as soon as a problem is presented their initial instinct is to become defensive and push back. In that case, your partner may not take steps to change their habits, but instead merely persist with their financially irresponsible behavior. In such times, it’s important to protect yourself from being caused harm financially. You may consider removing your partner from various bills and possibly set up separate accounts only in your name. Although this isn’t the ideal situation, you may not have a choice if your spouse continues to put you in financial harm; a situation that can be hard to dig yourself out of. Finances and money can be an uncomfortable conversation to have, however, it can be important to discuss habits and practices before deciding to spend your life with someone. Unfortunately, that doesn’t always happen. Whether you discover your partner’s financially irresponsible habits before things turn bad or after they’ve already done significant damage, there are thankfully steps you can take to turn things around. In any situation, just being open and honest about your situation can be the best first step to effectively communicating with your partner and possibly getting through to them. Marriage depends on both parties being willing to work through any problem that presents itself, and finances are no exception. Have you ever had to deal with a financially irresponsible partner? If so, what were steps you took to resolve the problem?